Devondale salt reduced butter is a good tasting butter and l bought it on sale to try from my regular,l would buy again on sale but my regular one tastes better! we just love this salt reduced butter option in our household. the kids love it on toast in the mornings and on their sandwiches at lunch, nothing is better than butter! Devondale have delicious and good dairy products and we eat many of them. Devondale Dairy Soft Salt Reduced Butter is particularly yummy on my freshly baked bread. We use nothing but Dairy Soft Butter in our family. We love the flavour and how creamy it is. And with someone who has a dietary requirement this is perfect. I love Devondale butter generally and this one in particular because it tastes the way butter should. Good on toast and plain bread. Just creamy enough, spreadable enough and salty enough! This is a great butter. We have to watch when choosing butters..or margarines..I’m definately a butter person. salt reduced but Devondale is very full of flavour and creamy. 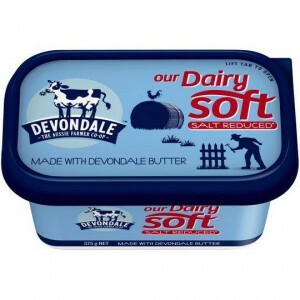 How would you rate Devondale Dairy Soft Salt Reduced Butter?